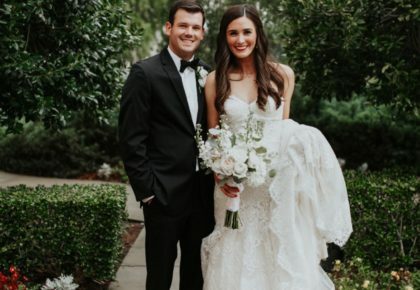 In true Southern fashion, Sadie and Devin were married in an adorable, outdoor wedding styled with vintage furniture rentals and greenery galore! 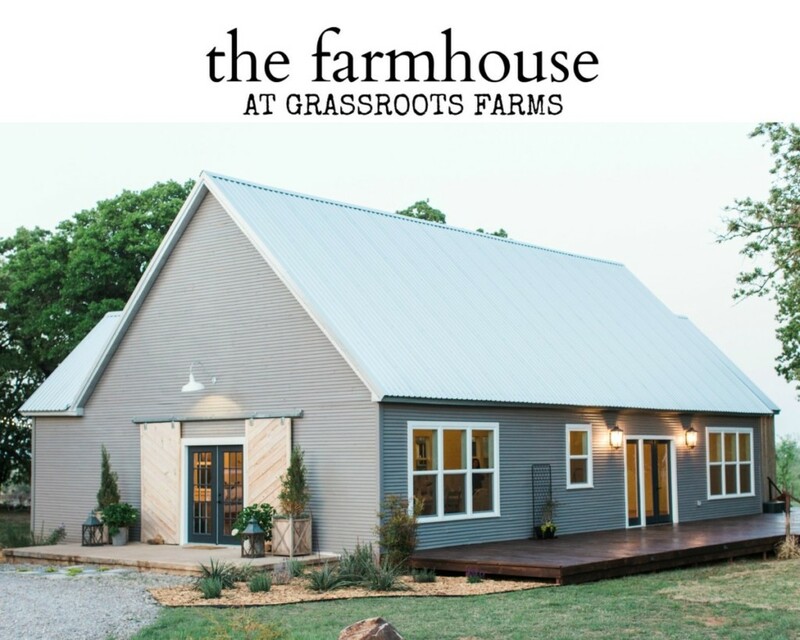 Oklahoma wedding planner, Mikkie Tucker of Grassroots Vintage Events, set to work creating the vintage story book fairytale day the couple had dreamt of, even raiding her one-of-a-kind wedding rentals to include those unique, mismatched pieces throughout. 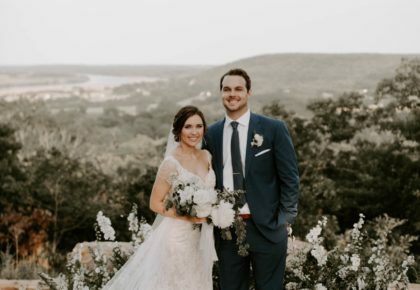 Scroll through to see Sadie and Devin’s charming Ardmore wedding! 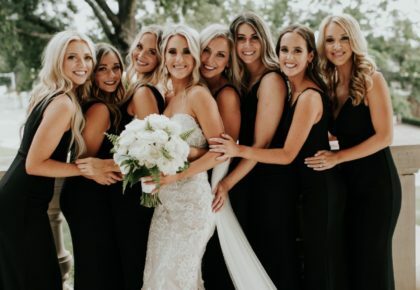 From the bride: “My wedding morning began waking up at The Cottage at Maria’s Garden surrounded by all of my beautiful bridesmaids. It was the most relaxing morning. Our hair dresser, Brandi, and our makeup artist, Allison, came to the house to help us get ready. I had comfy, personalized shirt dresses for the girls to wear to get ready in. We were all so comfortable and it was an amazing morning with my favorite ladies drinking mimosas and coffee. My husband on the other hand was going fishing with all of his guys. They spent time together and even almost sunk a paddleboat. I was so ready to get into my dress and show it off to everyone. My mom and sister helped me into my dress. A family friend lent me a 40 carat champagne diamond necklace, and as soon as I put it on I felt like a princess. My first look began with my dad. He has two daughters, just me and my twin sister who was married last year. I was his last little girl to get married. It was a beautiful moment. Devin and I had decided to do a first look. For one, I couldn’t wait to see him, and because we wanted to get lots of our pictures out of the way for the ceremony. [It was the] highlight of the day for me. I walked up behind him and when he turned around with tears in his eyes, and my heart literally melted. He looked so handsome, and I couldn’t believe that he was about to be my husband! Finally, it was time for the ceremony. Our ceremony was outside and thanks to our wedding planner, Grassroots Vintage, and all of her amazing rentals, we had the most perfect decorations. We had all vintage mismatched chairs and some benches mixed in. We had an altar behind our preacher that was beautiful. I can’t even describe it. My father walked me down the aisle, and I was so thrilled for everything to begin. Devin had tears in his eyes and I wiped them away. We knew we would be unable to say our own vows, so we came up with beautiful ones that we repeated back to each other. One of my favorite parts of ceremony was that we had both of our families come up and light a candle. We then took those candles and lit a unity candle. Our families were able to come together as one and pray with us. While this was taking place, my friend was singing “Fall Afresh” by Kari Jobe. The moment was completely magical. And finally, I was able to kiss Devin! “Time of my Life,” most well known in the end of Dirty Dancing, came on and we began our walk down the aisle. All of the aisle seats had bags of dried rose petals. As we jammed down the aisle we were showered with love in the form of petals. Our bridal party and our families then began to do choreographed moves down the aisle. We loved every minute of it! Our reception was a party. So many fun details, and it looked fabulous. My husband’s family is Czech, so we started it off with a wedding tradition called the “Wedding March.” Devin’s aunt and uncle led us and anyone else that wanted to participate in this giant conga line to Polka music. We went all over the venue and then ended up under a bridge of all of our wedding guests. It ended with our first dance, “I Cross my Heart” by George Strait. During our first dance everyone surrounded us and at random moments ran in and swarmed us. It was overwhelming. Definitely some great pictures came out of that! After our first dance was my first dance with my dad. My dad is an amazing singer and recorded himself singing “I Loved Her First” by Heartland. 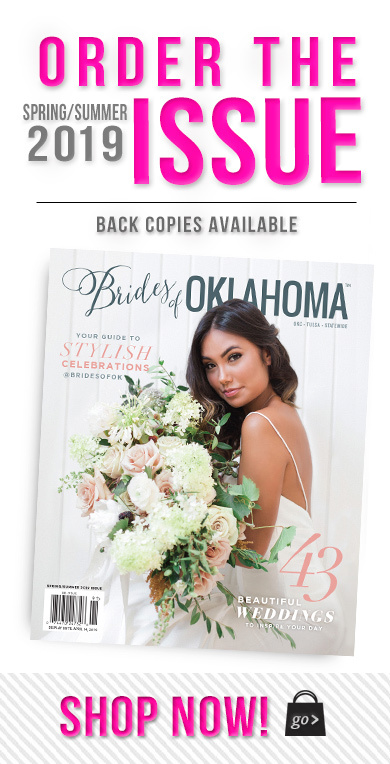 « Previous Post: Brides of Oklahoma Spring/Summer 2018 Cover Revealed!